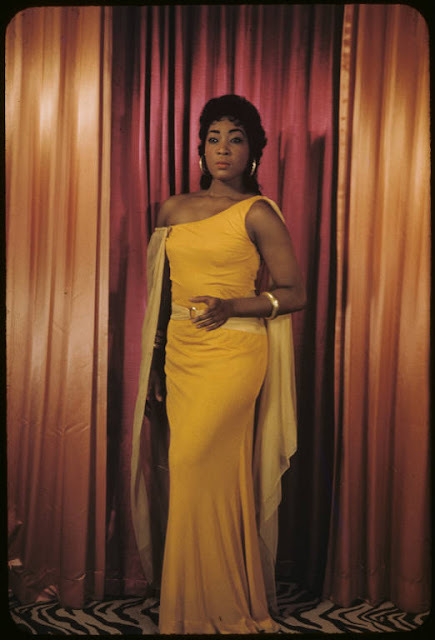 Gloria Davy as Aida. Just days after her Met Opera debut in the same role. Gloria Davy, the first African-American singer to perform Aida at the Met has died in Switzerland after a long illness. She was 81 years old. The daughter of immigrant parents from Saint Vincent, in the Windward Islands, the soprano was born in Brooklyn, NY. Educated at P.S. 129 in Brooklyn, the High School of Music and Art and the Juilliard School, where she studied with Belle Julie Soudant, Ms Davy was twice a Marian Anderson Award winner and received the top prize of the National Music Education League. In April 1954, while doing a post-graduate year's special study in opera at Juilliard, Davy appeared as Countess Madeleine in the U.S. premiere run of Richard Strauss's Capriccio. Davy's beauty, poise and grace — as well as her attractive, well-trained voice — seemed ingredients for sure-fire stardom, but success was hard won for African–American singers in the 1950s, and repertoire was often limited to those roles considered "acceptable" for artists of color. As was the case with her fellow Juilliard alumna Leontyne Price, Davy had one of her first big successes as Gershwin's Bess. In fact, in 1954, Davy replaced Price as Bess in an international tour of Porgy and Bess. During a scheduled tour stop in Milan, conductor Victor de Sabata was so impressed with Davy that he recommended she study the role of Aida for a future engagement at La Scala. Davy stayed in Italy for fifteen months, working on the role, and began to make a name for herself as a concert singer. The scheduled La Scala Aida was canceled "because of a political upheaval," as Davy explained in a 1958 OPERA NEWS interview, but the role served for her professional opera debut, in Nice, in January 1957, and for her opera debuts in Bologna, Italy and Zagreb, Yugoslavia. In July 1957, Davy won favorable reviews in a New York Philharmonic concert of Aida excerpts at Lewisohn Stadium in Manhattan. In October of the same year, Davy sang Anna Bolena to Giulietta Simionato's Giovanna Seymour in the American Opera Society's concert presentation of Donizetti's Anna Bolena at Manhattan's Town Hall. No long after that fateful concert performance, Davy made her Metropolitan Opera debut as Aida. On that February night in 1958, the 27 year old debutant shared the Met stage with Kurt Baum as Radamès Irene Dalis as Amneris and Leonard Warren as Amonasro. Although other African–American artists had appeared with the Met before Davy's debut — chief among them Marian Anderson and Robert McFerrin, who both made Met debuts in 1955 — Davy was the first artist African-American to sing the role of Aida, an Ethiopian princess, with the company. Time magazine announced, "Davy proved that the Met is where she belongs." However, despite good reviews, Davy's Met career was limited to just fifteen performances in four seasons; Nedda in Pagliacci, Pamina in Die Zauberflöte and Leonore in Il Trovatore, the role of her last Met performance, in April 1961. After Davy married Swiss stockbroker Herman Penningsfield, in 1959, she chose to base her professional activities in Europe, where she had important engagements in Berlin, Aachen, Geneva, Vienna, London, Strasbourg, Mannheim and Milan in the early 1960s. She continued to make notable U.S. appearances, though. In October 1960, Davy sang the title role in a concert performance of Strauss's Daphne with Thomas Scherman's Little Orchestra Society at Town Hall and was the soprano soloist in an international telecast of Beethoven's Ninth Symphony relayed from the United Nations and conducted by Eugene Ormandy. After Davy stopped performing, she taught voice. Following her retirement from Indiana University's Jacobs School of Music, where she served on the voice faculty for more than a decade (1984–97), Davy made her home in Geneva.